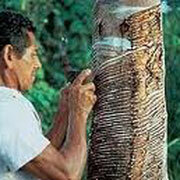 Rubber Tree - ARTE AMAZONIA provides a global voice through art for the indigenous cultures of the Amazon. Hevea brasiliensis is a species of rubberwood that is native to rainforests in the Amazon region of South America, including Brazil, Venezuela, Ecuador, Colombia, Peru and Bolivia. These trees are generally found in low-altitude moist forests, wetlands, riparian zones, forest gaps and disturbed areas. It is a quick growing tree, often the first to establish itself when a gap in the canopy is produced but may be shaded out as more trees fill in the canopy opening. 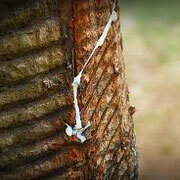 Today, commercially produced rubber can also be found throughout much of Southeast Asia and Western Africa. 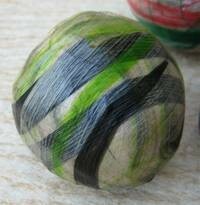 First discovered by the ancient Olmec, Maya and Aztec, the latex sap from the rubber tree was once used to make rubber balls, to waterproof clothes and even to form homemade shoes. 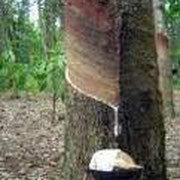 Today, the latex sap from the rubber tree is still used in the modern processing of rubber and is often a substantial source of income for indigenous populations. Chico Mendes, a Brazilian rubber tapper, became famous when he organized the National Council of Rubber Tappers in Brazil to help protest against the clear cutting of land for cattle grazing. Thanks to his efforts, the union gained the support of the Brazilian government and was able to set aside crucial “extractive reserves” within Brazil. These reserves allow for the sustainable harvest of goods, such as rubber or nuts, and protect against the clear cutting of trees. In 1988, Chico Mendes was murdered for his work to create extractive reserves and protect the rainforest. His efforts have been carried on by his coworkers and supporters across the world.